Currently, when a premature baby is placed in the Neonatal Intensive Care Unit (NICU), there are intrusive feeding- and respiration tubes, irritable ECG adhesives, surrounding alarms and noises from medical equipment, etc.... in general a lot of factors which can deliver stress within the most important developmental period of a baby's life (usually the completion phase within the womb). Design a (part of the) system to decrease the stress impact that the current situation is causing, so as to aid the better initial development of our future generations. Design As a follow-up to the first iteration of the Smart Jacket, I decided to focus on measuring the Breathing Rate using a non-intrusive method of dynamically measuring the expansion/contraction of the baby's lungs from the outside. Thus a new Breathing sensor was developed with special stretch fabric with conductive capabilities, which changes in resistance when stretched. The sensor was implemented in the form of the previous smart Jacket, taking into account factors such as comfort and electric shielding for the testing procedures and potential final product. 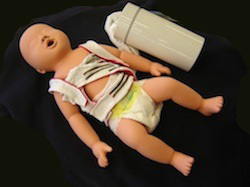 The prototype was entirely sewn and constructed by me, medically approved by the hospital for small testing and fully tested on real patients in the NICU.